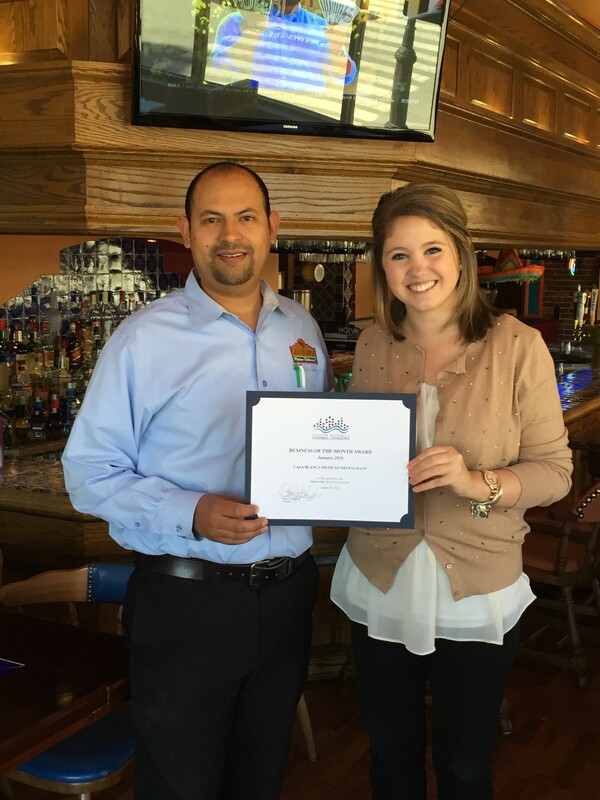 Ashleigh Bergh, Membership Coordinator presents Casa Blanca Restaurant owner, Jorge “Alex” Vargas with the Business of the Month Certificate on a recent lunch visit to the Haverhill store. The Greater Haverhill Chamber of Commerce is delighted to award Casa Blanca Mexican Restaurant with the January 2016 Business of the Month distinction. 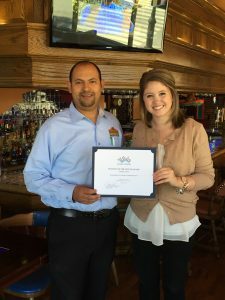 This special recognition serves to highlight their outstanding support of the local community, consistent participation in community based events, willingness to host business, fundraising and social events and their strong commitment to providing authentic Mexican food to the people of Haverhill, Massachusetts. Casa Blanca Mexican Restaurant is a locally owned and run family business. With four locations now populating the Merrimack Valley, and riding the waves of a good reputation and amazing authentic Mexican dishes, the restaurant expanded into Haverhill late in 2014. The restaurant is the third for the Vargas family who also helped to establish the “sister concept” for the brand, which was opened under the same name in North Billerica in 2009. This location is owned by the Cervantes family, who are not only close friends of the Vargas family but are also from the same region of Mexico. The foundation for the Casa Blanca brand is built on the traditional Mexican values for hospitality and family. It is the mission of both families to immerse their guests in Mexican culture from the moment they walk in the door, by making every person feel at home and a part of the family. Business of the Year award. That honor is announced during the annual breakfast which has been scheduled for February 3, 2017.